The Nevada Appeal had a follow-up article today about the Virginia & Truckee Railroad depot location (which they wrote about on Saturday and I wrote about yesterday). The Railway Commission met on Monday to discuss possible sites for the depot, and apparently the search has been narrowed to two, both of them out Highway 50 East. So I took a trek out to that part of town to check the sites out for myself. The first location is the one that was mentioned in Saturday’s article, the land owned by RIDL Ltd and proposed by Andy Hettrick. This plot of land butts right up against the hills at the eastern edge of town, amongst the warehouses that dot the landscape out there. 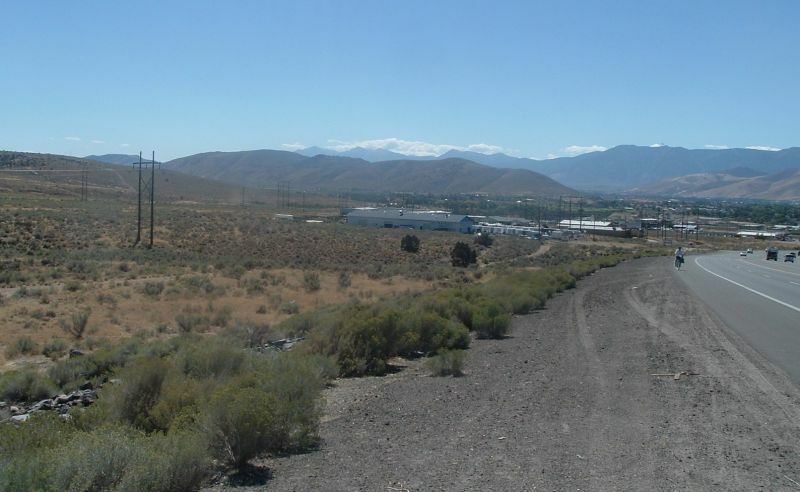 This one seems to be the preferred site, because not only is it slightly elevated, giving this view of Carson City and the mountains, but it’s also 153 acres large, so there’s plenty of room for other development. Everyone’s talking about building a hotel, casino, shopping center, and other attractions to surround the railroad depot. 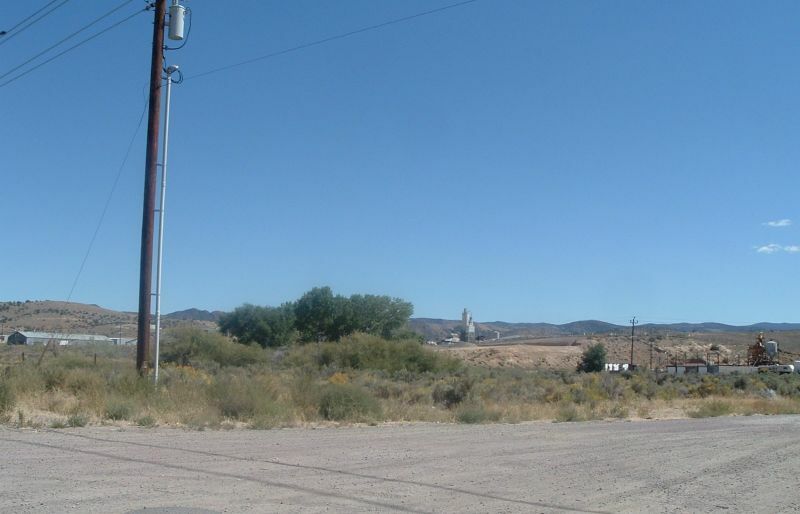 According to Commission member Janice Ayers, it’ll be Carson City’s version of Disneyland. Only with blackjack and hookers. But there is one more site still under consideration, this one on Highway 50, a little bit before Deer Run Road. The advantage to this site seems to be that it has excellent access from the highway, and it’s about a mile closer to town than the Hettrick land. But it’s a smaller parcel, so there’d probably only be room for the depot and not much else. Plus it’s got that excellent view of the concrete plant up on the bluff; what more could you want? There were seven other sites up for consideration, sprinkled all around this part of town and along the river, but these were the only two that were actually visible from the highway. And visibility is crucial for this project; the Railroad Museum near downtown runs steam engines right along Carson Street, and I’m sure that pulls in a lot of people who would have otherwise passed it by. And so it should be with the V&T depot; people have to be able to see it, or they’ll never know it’s there. And while it would be nice to have a site that’s closer to downtown, there’s been so much development in the last 50 years that there’s no way to run railroad tracks anywhere near the heart of town. So it has to be out here, where there’s still a lot of empty land, and personally I’d say the Hettrick property is the better choice. The Railroad Commission meets in November to make their final decision, and I suspect they’ll agree with me. Head on over to NewsCarsonCity.com to see Dave Morgan’s report on the Commission meeting and the two sites. There’s no permalink for his report, but the full video (WMV, 3:35) can be downloaded here.